The same computing DNA that produced the communications revolution has also created acute vulnerabilities – – and attractive terror targets – – for societies that depend on cyberspace for national security and economic survival. Back in March of this year, security officials invited members of the Senate to the White House for a classified presentation illustrating what would happen if an enemy state – – or even a talented, lone hacker – – launched a spear phishing attack against New York Cityâ€™s central computer systems, effectively shutting down the urban centerâ€™s electric grid. The simulation was a more simplified version of the Pentagonâ€™s ongoing cyberwar games, presented to Congress to push for a bill that would allow federal control over protecting the computer networks that runÂ Americaâ€™s most exposedÂ infrastructures. Earlier this week in a feature article inÂ The New York Times, U.S. President Barack Obama publicly announced the joint U.S.-Israeli effort to take out Iranâ€™s nuclear program in a blatant act of cyberwarfare. This is the first time in history that the U.S. has admitted to using cyberweapons to cripple another countryâ€™s infrastructure (although there have been a slew of smaller reports of attacks against personal computers used by Al Qaeda operatives). But the launch of the Stuxnet virus â€“ code-named â€œOlympic Gamesâ€ â€“ was on a totally different level of sophistication, and was carried out with deep Israeli involvement, most likely including Israelâ€™s elite signal intelligence corps Unit 8200, led by a Brigadier-General whose name is kept strictly classified. The Israelis are well aware of the zero-sum game involved in the world of cyberwarfare, as evidenced byÂ statementsÂ made today by Israeli Defense Minister Ehud Barak inÂ The Jerusalem Post. Israel plans to become a world leader in the development of cyber capabilities, and to be fair, the chops theyâ€™ve shown so far indicate that they might already be there. So, even if the Americans are a little miffed over possible deceptions that took place during the Olympic Games operation, Israel is not a strategic ally that will be tossed aside so easily. The Americans should also keep in mind the extremeÂ and existential threats Israel faces in the region, as well as the multitude of hostile countries it must balance. These factors can at least partially explain the heightened urgency and daring in Israel’s national security decisions. Concerning potential damages, Barak warned:Â â€œCyberwarfare has taken asymmetric warfare to a new height, allowing a lone hacker to cause major damage.â€Â Whether this was referring to Israelâ€™s vulnerabilities, or as a barely veiled threat to its enemies, is unclear. And yet an obvious question must be asked: Why now? Speculation against the U.S. and Israel over Stuxnet has been around for awhile, but why is Obama making this provocative announcement just now? 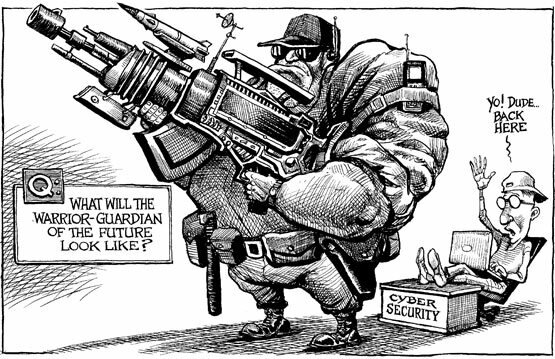 It could very well be that, despite the real cyber threats Iran faces, the recent declaration of cyber war is a decoy. It forces Iran to shift its resources towards defensive measures surrounding its computer systems, when it might very well be that the next attack is going to be something completely unrelated and even more incapacitating. The Pressing Questions:Â How will global strategic relations be affected by the shifting power politics connected to cyberwarfare? Should the U.S. legitimize the use of cyberweapons as a covert tool? At what point will cyberwarfare become so destructive that countries will need to consider developing treaties to control its use? ← Previous Story Why did the Israelis steal hummus from the Arabs?